The plan is to install led lighting. I will also install low level background lighting that operates on a 12 volt DC supply. The idea is to have this low level lighting operating from dusk to dawn and act as a backup to power failures and hopefully reduce power usage by not having to switch on/off the main lights as one goes around the house at night. The light level planned will be equivalent to the light output of a candle and these will be placed approximately 2 metres apart in hallways and bathrooms near the floor level. For the principle lighting I will be using Sharp Zenigata Leds that have a very high Colour Rendering Index value (CRI). The CRI is an important factor in trying to reproduce the colours of everyday items. One may have noticed that the majority of led lights reproduce colours poorly ie. red does not look like red, green does not look like green etc. 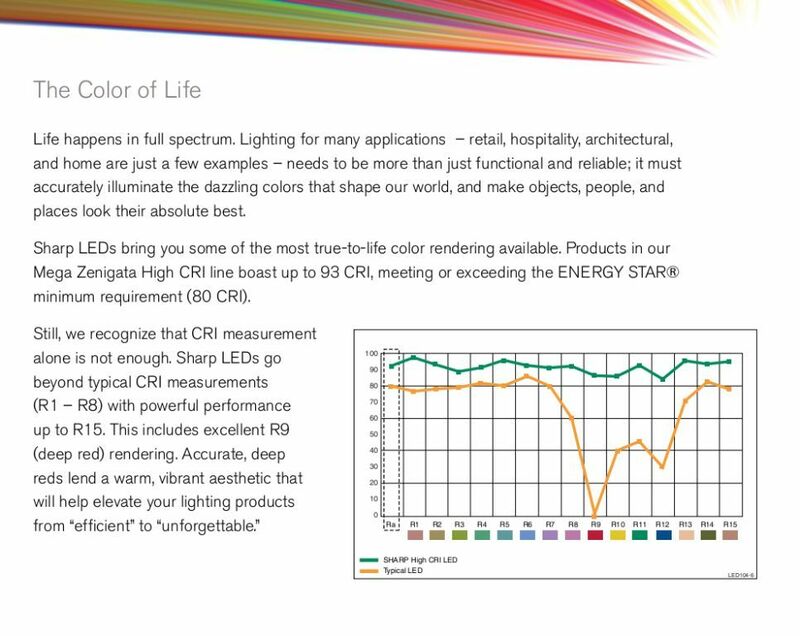 The CRI value is one of the standards used to compare the colours reproduced by Led lights to that of a halogen/incandescent bulb. Most manufactures may only indicate a colour temperature figure like 2800 degrees kelvin. This works independently of the CRI value. No LED manufacturer has of yet been able to reproduce the colours an incandescent bulb or halogen bulb can reproduce. Below is the best explanation of CRI values I came across. A factor that determines the reliability (life) of LED lights is the management of heat and the ability of the manufacturer to try and squeeze lots of electronics into a lamp that operates at around 60-100 degrees Celsius (high power type that can replace 50 watt halogen lamps). The two factors do not work together so I plan to separate the electronics from the heat by only installing the LED lamp in the ceiling fitting and use a separate device called an led current driver to power up to 3 led ceiling lights. In this way I hope to get the full 10-15 year life of the led lamp. (I will probably want to change them before that time though as the technology advances). Self Build Housing for the Led lights. I could not find a Led lamp that used the sharp petite zenigata high CRI led and be sure it was designed properly. For this reason I decided to build my own. In order to do this one needs a suitable heatsink (a device to remove heat efficiently) and enclosure for mounting the led light in the ceiling. 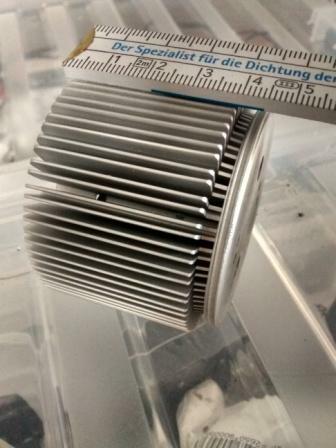 A heatsink will usually have a power rating that specifies what size led it is suitable for. Below is a 6 watt heat sink. 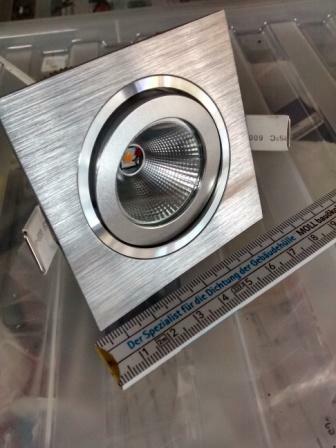 This is approximately the size heatsink that is required to replace a 50 watt halogen down light. 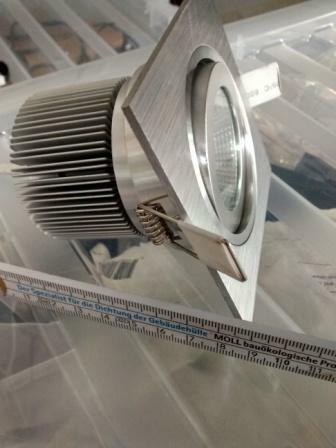 One can see the challenge manufactures face in trying to adapt led lights to fit into existing halogen lamp housings with all the electronics and a suitable heatsink that would extend the life of an led. The principle as stated before for this self build design is that it allows me to remove all the electronics to control an led into a separate enclosure that would not be effected by the heat. By doing this reliability is increased. In other words simplify the design by lowering the component count and thus extend the life. The pictures below are the finished Led Housing .